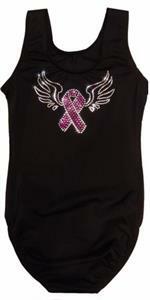 Support Breast Cancer Research by purchasing one of these pink ribbon gymnastics leotards. 5% of each sale goes directly to organizations* dedicated to providing breast cancer awareness programs and initiatives. This category includes both in stock and catalog styles. 6338 Pink Under Armour® by GK EliteArmourFuse® sublimated holotek gymnastics leotard with hair scrunchie. Under Armour is no longer making gymnastics leotards. Once these are gone, they are gone! 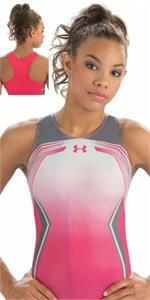 6339 Power Under Armour® by GK EliteArmourFuse® sublimated subfuse gymnastics leotard with hair scrunchie. BCA43 Pink Strides Breast Cancer sublimated subfuse and neon pink muscle mesh gymnastics leotard with amazing open racer back. BCA38 United - Black nylon, princess pink sparkle hologram, berry mystique breast cancer gym leo with sequinz™ and free hair scrunchie. retired style - last one! $5 of every purchase of this leotard will go to the Breast Cancer Research Foundation! * GK brand leotards contribute 5% of sales of their products to Unite for HER, a non-profit organization dedicated to providing breast cancer awareness programs and initiatives. 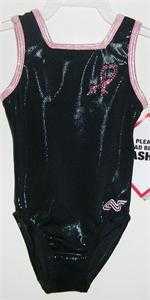 Alpha Factor brand leotards contribute 5% of sales of their products to the National Breast Cancer Coalition. Snowflake Designs brand leotards contribute 5% of sales proceeds of their products to the Breast Cancer Research Foundation.